If your teeth are healthy but you aren’t crazy about the way they look, a complete smile makeover could be the solution. It can revolutionize your entire appearance, so it is vital to sit down with your dentist to design the smile that is truly right for you. Here are 3 things to consider when planning your smile makeover. Although you may dream of the “perfect smile,” teeth that are too straight, too white, and too perfect tend to look fake. If you are absolutely set on this type of smile, you may need to have your lips, cheeks, and other facial features reshaped or plumped to support the look. For most people, the perfect smile is actually the natural-looking smile that best fits them. This retains your natural features, fits your face, and enhances your overall appearance. It is straighter, whiter, and more symmetrical than your existing smile, but it is not overwhelming. You and your dentist will work together to choose the size and color of teeth, as well as the shape of each tooth, that fits well with your natural face shape, features, and skin tone. Your dentist will then consider the current alignment and spacing of your teeth, as well as any missing or stained teeth, to make recommendations for the treatments that will get your smile where you want it to be. Of course, if you have any existing tooth decay or gum disease, it must be addressed before your smile makeover starts. Designing your smile makeover will go more smoothly if you and your dentist have a place to start. Bring in photos of your childhood smile, and be ready to discuss what you liked and disliked. Also bring in photos of smiles you like, whether they belong to celebrities or your own friends or family. Think about any smile quirks you admire, such as pointy canine teeth or a slight gap. 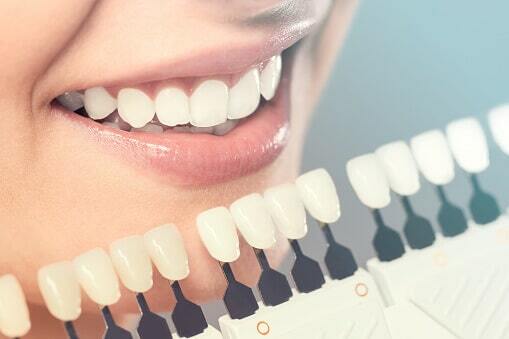 Once you and your dentist have settled on a smile design, your dentist will take a photo of your existing smile, and use digital technology to morph it into your proposed new smile. This is a collaborative effort, so now is the time to speak up about any changes you would like to make. Your dentist may also make suggestions for changes at this point. The next step is to create models of your teeth, and create your new smile in wax. This lets us make sure that the teeth come together properly, and that your new smile is functional as well as aesthetic. We will not make any changes to your teeth until you and your dentist are both entirely satisfied with the wax model. A smile makeover is a wonderful way to create the smile of your dreams. It is a team effort, and may take several visits to fully complete, but most patients agree that it is well worth the trouble!